Essential signs maintenance project: a number of old ADS on steel and concrete posts in the Royal Vale area network required urgent replacement with passive safe Lattix masts. Due to the location of the signs on a busy network, both urgent replacement and the potential disruption caused by the works was one of the main challenges of the project. We used the innovative ground screw as the foundation for installing seven new ADS. Ground screw is a robust foundation system and a sustainable alternative to traditional concrete foundations for traffic signs and marker posts. The system removes the need for excavation and concreting, significantly reducing installation time, long term costs and traffic management requirments. 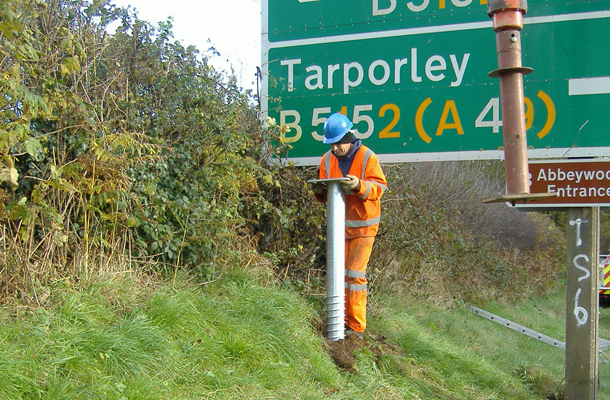 The ground screw system is compatible with Lattix masts and other passively safe posts.